Clean, condition, and protect in one, spray-on step. SONAX High Speed Wax is a simple and effective way to keep your car looking showroom new. The easy on/easy off spray wax emulsion seals the paint surface with a combination of carnauba and silicone. Use SONAX High Speed Wax between wax treatments to maintain a clean, sleek, shiny finish! SONAX High Speed Wax is based on high tech chemistry that results in a slick shine. 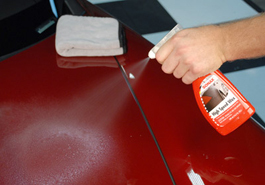 A blend of microscopic carnauba wax and a special silicone emulsion deliver a streak-free gloss with real protection! Other liquid waxes can be streaky because the wax particles are too large or are not adequately stable to spread evenly. SONAX High Speed Wax takes advantage of SONAX's ground-breaking nano technology. The micro wax particles distribute evenly, resulting in a clear, streak-free finish every time. 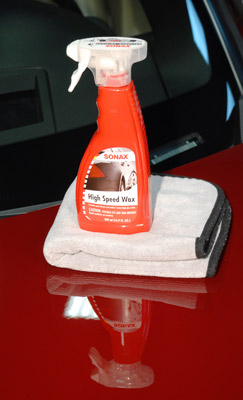 SONAX High Speed Wax is also suitable for quick touch-ups on plastics, such as vinyl convertible tops. SONAX High Speed Wax makes surfaces look instantly glossy but has the true staying power of a polymer wax. Use SONAX High Speed Wax after washing to restore any protection that may have diminished as a result of environmental exposure since your last wax or sealant application. It's an excellent maintenance wax when you're pressed for time or just want to give your vehicle a quick touch-up. For the best results, use a plush Cobra Deluxe Jr. Microfiber Towel to buff the paint using SONAX High Speed Wax. The deep nap will further protect the paint from loose dirt as it buffs paint and plastics to a brilliant shine. SONAX High Speed Wax contains micro wax particles that bond to the paint. 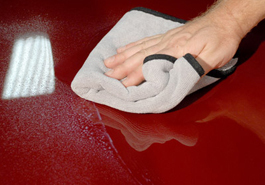 Use a plush microfiber towel to buff the paint to a deep gloss. Use SONAX High Speed Wax to restore real protection and a fantastic gloss to all auto paint finishes and plastics.